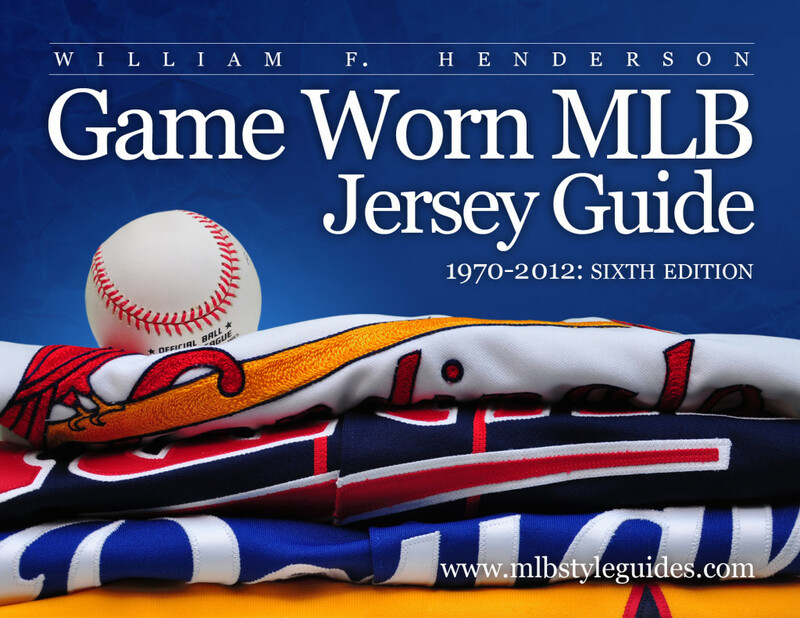 Big Time Jerseys announces a partnership with Bill Henderson, MLB historian and author of the definitive reference, “Game Worn MLB Jersey Guide” to ensure the most authentic recreations of player name and number lettering on any MLB jersey, 1970 to present. 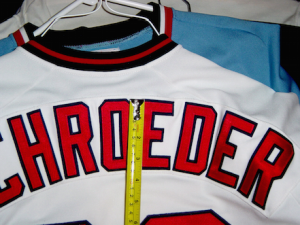 Using Henderson’s enormous personal collection of game worn MLB jerseys, exact lettering templates have been created that are correct in every detail: just the way the teams themselves did it in that year, on each style of jersey. Henderson owns one of the largest personal collections of MLB jerseys in the world. If you have blank team jerseys to letter, or want jerseys stripped and re-lettered exactly with another player’s name and number, or if you have original game worn jerseys to restore that have been altered in their journey through the minor leagues before they found their way to you—Big Time Jerseys is ready to help you. is just not good enough! Time was, every team had its own local tailor or seamstress, and that little shop had its own set of lettering patterns. There was no standardization, and the cutting patterns were often simply sheets of vellum paper poked with hundreds of pinholes, so that when the paper was dusted with talcum powder, the faint images of outlines appearing on the twill were then cut with sharp scissors. Other shops used “cookie cutter” patterns made of steel or tin, that, when rapped on the back with a hammer the sharp edges cut the twill neatly for sewing. Some used tracing patterns made of heavy paper or wood that were laid onto cloth and traced with a pencil for cutting. Up until about 2000, there was little commonality between teams, and using automation to create and cut patterns was rare. Often teams would have home jerseys lettered by one company and road jerseys by another, with batting jerseys made by a third shop. All three would be different from each other, and sometimes were different even from year to year. Players who were acquired after the start of the season might have different lettering than those who were with the team on opening day. Even in the years after 2000 when computer-based cutting patterns began to proliferate, still there have been many inaccuracies between what is even the “official” team patterns and what the jerseys look like as worn on the field. 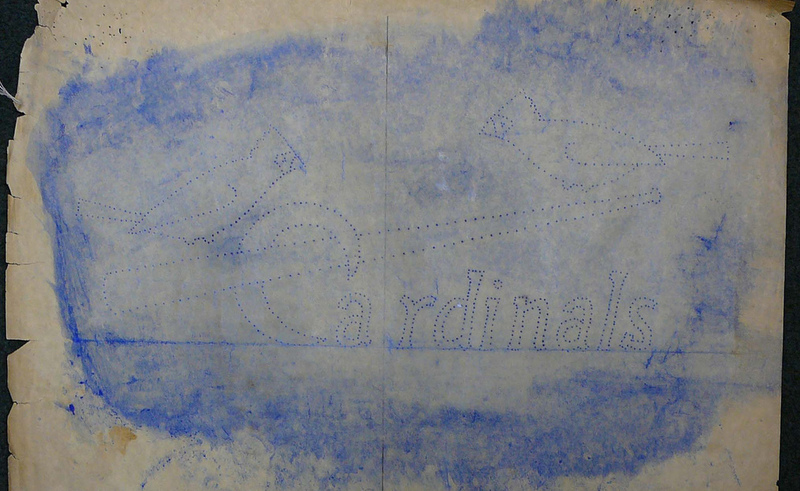 Ancient paper pattern for the Cardinals Script. Notice the pinholes for dusting with powder. 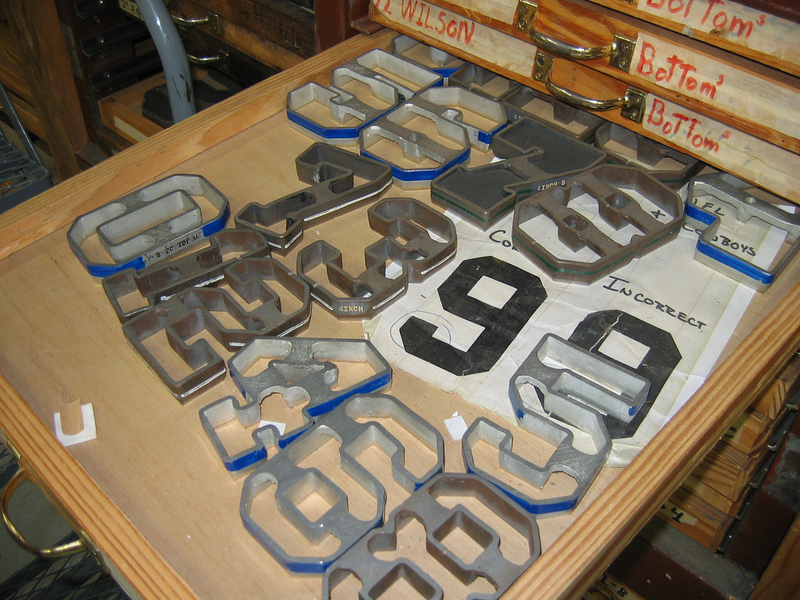 Old Wilson metal “cookie-cutters” for Yankees numbers, Rapping them on the back when laid on twill cut the cloth exactly. • There are inconsistencies between some official-team patterns and what was actually worn on the field. A team will approve one type font for player names for the published guide, then in practice use a different pattern for team-issued jerseys as the season begins. • Are player names used that year, or not? If so, are NOB nameplates used, or not? This practice varies from team to team, and year to year. We have the records of when NOBs were used and when nameplates are correct. • Often, narrower, condensed and extra-condensed width versions of NOB fonts are used for players with longer names. These fonts are not included in most pattern sets available anywhere. We have them, and we know when to use them. • Player name and number heights and twill outline widths of lettering layers vary by team and by year… there is no such thing as “standard”. “Standard” 8” back numbers vary by team from 7 .” to 8 .”, depending on the team and the year. “Standard” lettering may be outlined as small as 1/8”— or three times that wide. It seems like a small detail, but it is clear to the collector when done right… or when it is done wrong. • We do Vertical Arch player names when they are called for: no sweat, and in the correct font and size. There are many versions of these fonts as well: 1980 SF Giants NOB Vertical Arch is decidedly different than 1977 Phillies, or different from 1983 Twins. In the first photo, all four of the examples shown are defined generically as “block style” player name-on-back (NOB) lettering. Yet each one is different from the others, in width, boldness, thickness of outline and number of colors. Are the centers of letters like the “R” and “D” open or closed in the outline layer? Is the name on back less than 3 inches tall or more than 3 .”? Are condensed fonts substituted for long names… or does the team use the same font for all length names? 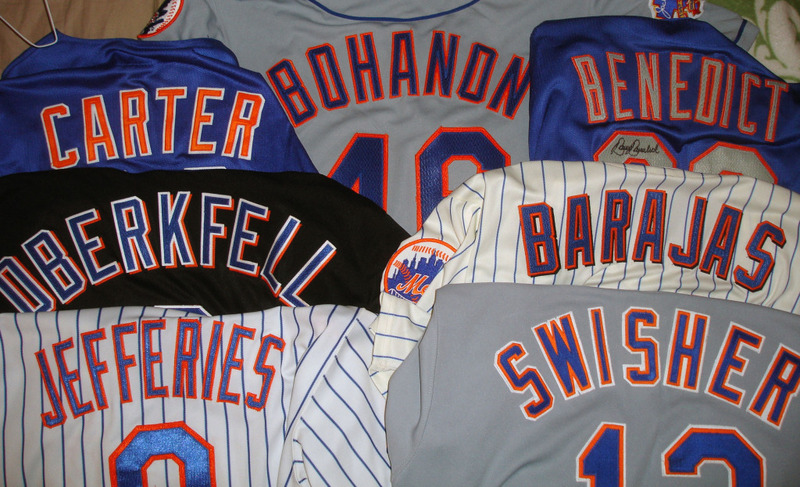 As if that’s not enough, the next photo shows a collection of ONLY game-worn Mets jerseys from between 1987-2013. 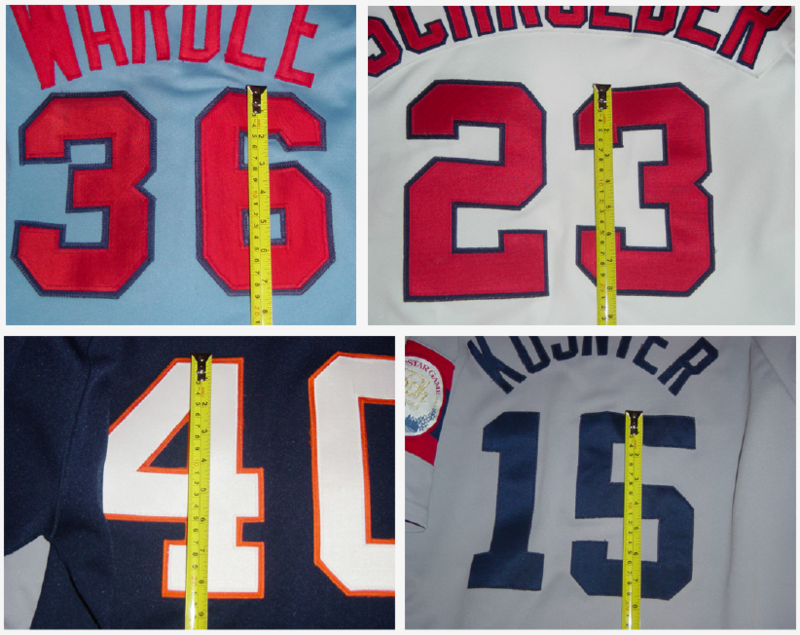 Each one of the seven jerseys uses a different variation on fonts, sizes, colors and types of twill. Which years do the Mets use ribbed twill? Glacier-patterened twill? Plain twill? Which years have two colors, three colors, white outlines and which use dropshadows? Yes, we know them all. 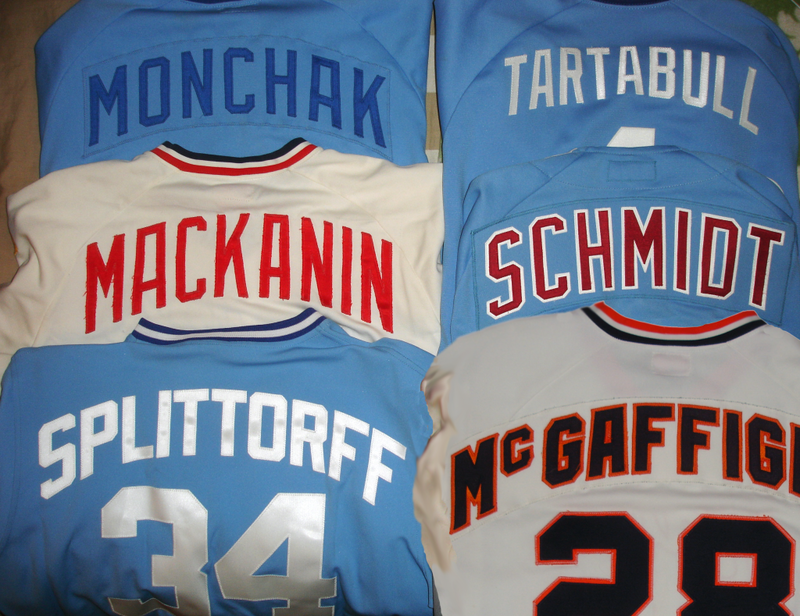 Finally, these six jerseys are all lettered with custom vertical-arched player names. Again, all six are different from each other… Twins lettering is different from Braves is different from Royals is different from Phillies is different from Giants… you get the picture. When you send your jerseys off to be lettered, almost nothing is worse then waiting to get them back and finding that they are wrong. Rework risks damaging the jersey and straining your relationship with the provider, besides wasting a lot of time. • That through the mid 80s, many team’s jerseys used different lettering fonts for home and away jerseys because the sets were made by different companies? • That “Standard 8” Back Numbers” rarely are? Depending on the team and the year, they vary from 7 .” to 8 .” tall. 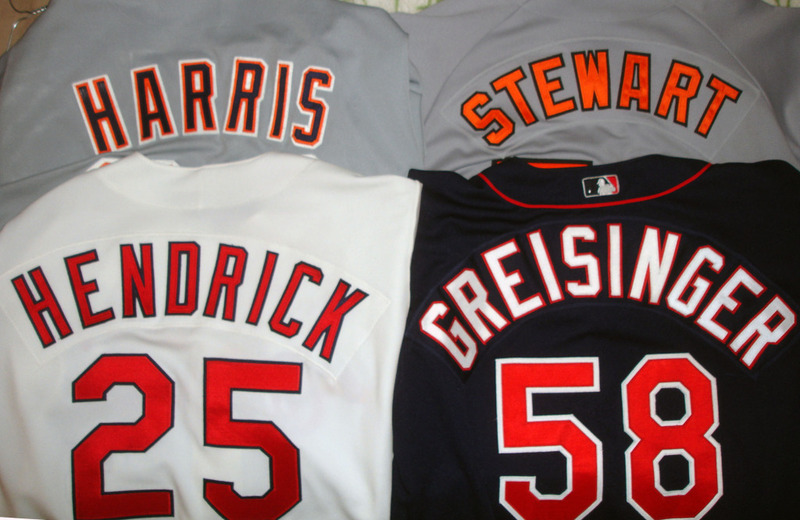 • That there are probably 10 different shades of gray fabric used for nameplates? • That even some of the “official” templates circulating from MLB are incomplete and incorrect? For example, the alphabet fonts used by the San Francisco Giants, the San Diego Padres is very different from what is listed as “official”, and front numbers on all jerseys are differently proportioned from the back numbers, and these front number fonts are unpublished? • That in the pre-computer age, lettering was done by local shops in each town, often stenciled on fabric using pinholes in heavy paper then dusted with talc, then cut by hand using scissors? Or, lettering was stamped out of cloth using cookie-cutter-like implements and a heavy mallet? These analog patterns are mostly long-gone. • That the “actual” original font patterns for most teams prior to 1990 no longer exist anywhere, and that MLB (through Majestic and Mitchell & Ness) have used my patterns for some Turn Back the Clock games? …that “Standard 8” Back Numbers” rarely are? personal collection to guarantee accuracy. 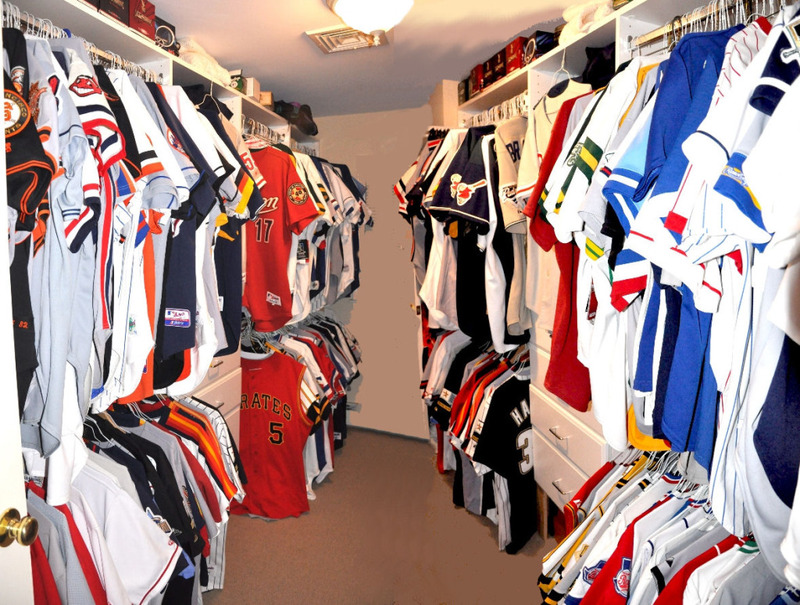 Pictured here is about half of the Henderson MLB jersey collection. Collecting since the mid 80s, Bill’s casual goal was to find “one of every jersey worn by every MLB team since the start of the double-knit era in 1972.” He doesn’t have every last one, but the collection is around 1000 pieces; probably more examples of the breed than you’ll find in any private collection around.